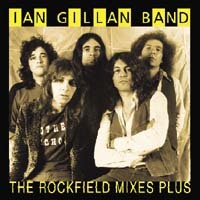 So just exactly what are “The Rockfield Mixes”? In essence they are the second and most dynamic of The IAN GILLAN BAND albums, namely “Clear Air Turbulence”. The mixes on this CD were done at Rockfield Studios in Wales but Ian Gillan was unhappy with the results and the album underwent a major remix before it was finally released on 15th April 1977. A reissue of the original mix of the second and arguably best IGB album, Clear Air Turbulence, complete with bonus tracks, of which the most welcomed is the previously unreleased live version of Over The Hill from Hiroshima. Add a couple of tracks that were left off the Rarities package and it makes a worthwhile purchase for those who didn't pick up the album first time around. ...a jazzy, inventive record driven by the wristy rhythms of Nauseef, Towns' eclectic piano and Fenwick's funky guitar, was arresting...Gillan has never explained why he remixed the album, but it's tempting to conclude that he found the original sessions a little too outre. Heard with the distance of decades, they suggest that the IGB had ideas that outstripped his ambition. ...it shows that Mr Gillan got two albums for the effort of one! Should appeal to more than just the fans.